With energy and determination, Katherine Trefusis-Forbes steered the Women's Auxiliary Air Force (WAAF) through its early years. Working tirelessly, she helped shape it into a successful organisation. As Chief Instructor at the Auxiliary Territorial Service (ATS) School of Instruction in 1938 and Commander of No. 20 ATS RAF Company in 1939, she demonstrated the skills and experience necessary to lead the new air force. On 1 July 1939 she was appointed Director to "advise the Air Member for Personnel on questions concerning the WAAF". Overseeing the rapid expansion of the WAAF - 8,000 volunteers were enrolled during the first five weeks of the war - problems of supply and accommodation were tackled. Policies on discipline and training were developed and regulations regarding pay and conditions were set out. For Katherine Trefusis-Forbes the welfare of the women in her charge was a constant priority. 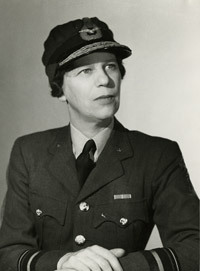 In October 1943 Air Chief Commandant Trefusis-Forbes relinquished her appointment and undertook firstly a tour of Canada to assess the Women's Division of the Royal Canadian Air Force; and secondly a tour of India to investigate the possibility of employing women in South East Asia Command. The decision that WAAF personnel would serve in the Far East was taken upon her recommendation. In January 1944 Katherine Trefusis-Forbes was made Dame of the British Empire (DBE) in recognition of her work. In August 1944 she retired having laid the foundations on which the Women's Auxiliary Air Force continued to grow. "...the success..achieved by the WAAF... could never have been reached without the inspiration and encouragement which you have always given"